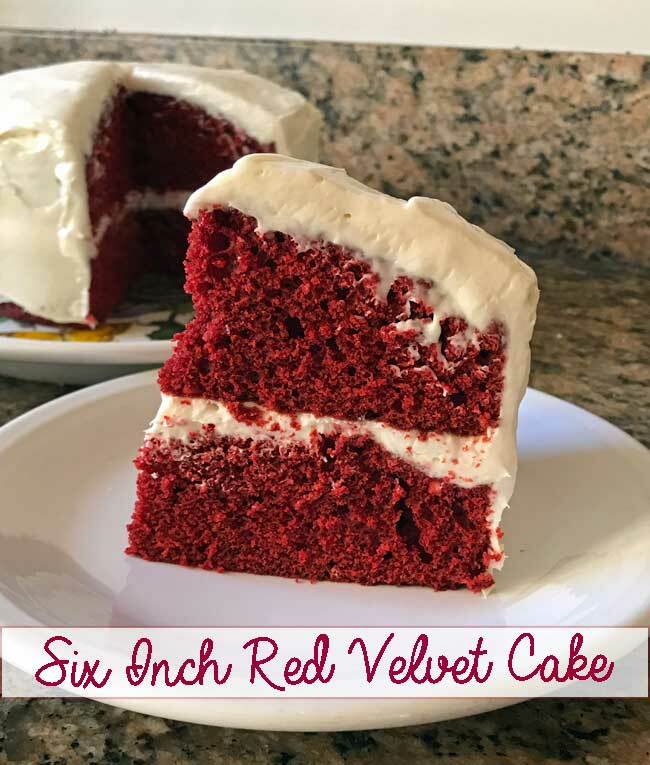 If you bought some six inch round cake pans and are looking for ways to use them, here’s a six inch red velvet cake with cream cheese icing recipe. For the red food coloring, I use a product called Super Red which gives the cake a very vibrant red color. If you can’t find the Super Red, you can use red food coloring, but you may need to use a little more. Six Inch Red Velvet Cake is perfect for when you need enough cake for about six people. Grease two 6 inch round cake pans and line bottoms with parchment. Grease again and dust with flour. Stir together flour, baking soda and salt and set aside. If using buttermilk powder, add that as well. In a large measuring cup or bowl, whisk together milk (or water if using buttermilk powder), egg, vanilla and vinegar. In a custard cup, make a paste with the cocoa powder and red food coloring. In a mixing bowl using an electric mixer, beat butter, oil and sugar at medium-high speed, scraping bowl, for 3 minutes or until light and fluffy. Reduce mixer speed to low and add the egg/milk mixture, then beat in the cocoa/red mixture until smooth. Add flour mixture gradually, stirring until batter is smooth. Divide batter between the two pans. Spread evenly in pans and bake for 2-23 minutes or until a toothpick inserted in center comes out clean. Cool in pans on wire rack 10 minutes. Invert onto a cooling rack and let cool completely. Beat cream cheese and butter in a large bowl with electric mixer on medium speed until blended. Gradually add powdered sugar until smooth (taste test after 2 cups, and add more as needed). Beat in vanilla.